PS--this book is NOTHING like Twilight, despite the inevitable comparisons because of the subject matter. It's in a class all its own. 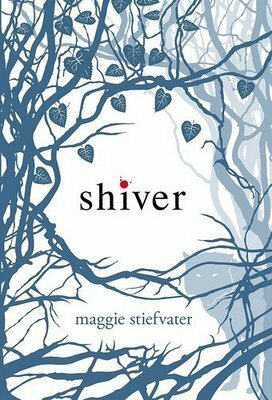 Sign into Goodreads to see if any of your friends have read Shiver. “Grace stopped in the door, dimly silhouetted by the dull gray morning light, and looked back at me, at my eyes, my mouth, my hands, in a way that made something inside me knot and unknot unbearably. So I assume you are looking forward to the Shiver movie then? Umm...I don't know about that. Depends on who makes it/stars in it/etc. But the tone of this book would be hard to get right. Oh, I've read Linger. :) Of course! I liked it, though I'm into Sam and Grace more than Izzy and Cole. I'm looking forward to FOREVER, though! And I'm kind of looking forward to closure, too...for all of us! I should probably read this after all. Yes, please, Maja. But don't tell me if you hate it. It will break my little heart in two. I don't think that's going to happen. I trust you. We seem to agree on these things. Awesome thanks! I've never gotten around to reading this and I rarely listen to audio books so maybe I should give it a shot. I hope so, Maja! And you're welcome, Aleeza and Bonnie. I edited the link above so it takes people directly to the Shiver and Overdrive software (which you'll need to listen to it) download. Honestly, I think I'd still prefer to read this particular book, but I know audiophiles may enjoy this more. They have Romeo and Juliet available as a free audiobook this week, too...plus more coming! Great minds must think alike. I was just about to post a status update that this book, along with Romeo and Juliet too. The more people who can take advantage, the better! Nice one, thanks for the tip! Maja wrote: "I should probably read this after all." Maja, you should try this, I liked it very much! I didn't like Linger as much but Shiver was just as Wendy describes it. Lovely, lyrical and achingly sad. I'm in the mood for achingly sad books anyway. Maja, it's free as an audio download this week. Even if you hate it, you won't have wasted any money. OR you may kiss her dainty paw, sobbing with equal parts pain and pleasure over this beautiful book. Not for my country it isn't. But it doesn't matter. I'd rather read it anyway. Lisa, I don't think I can! She's my fairy godmother. Blaming her would be very, very wrong. I need to read Linger. I felt the same about Shiver. The writing is absolutely beautiful and I find calling it "slow" and "wordy" a little bit crazy. I also find comparing it to Twilight silly. But what can ya do? Well. I've heard these called much worse, and it's one of those series people seem to enjoy ripping into. I totally get that this book isn't for everyone, but I will never understand reviews that seem to take such pleasure in being negative. But anyway--I hope at least that people will read it and find out for themselves whether it's something they like! If it's taken seriously with casting and not given a "dream team" it has the potential to really be a great film. The tone and presence attributed to the writing could absolutely amplify the story. I thought these were fantastic books and look forward #3. I got made fun of by just about everyone I knew that knew I was reading them but it was well worth it, I think at least. I hope they do a good job with it, Wesley. I agree it has a lot of potential, but I always try to manage my expectations with these things. Great review, I absolutely loved this book and Linger. Less than a month until Forever, woo! And thanks, Thomas...this is one of those reviews I went back and added after I started using GoodReads more regularly so it's not as detailed as usual. But it gets the point across, I think. So excited for FOREVER! Just a few weeks away. Now, now, Wendy, you're making me curious. I might try this one after all. There is some humor in it ("Hello, Grace's parents, I have never had my tongue in your daughter's mouth"), but it's true that it's more subtle. And the book is definitely sad. I doubt it too, lol, but the little cheesy fangirl in me might be indulgent. I wish I could LIKE this review a hundred times, Wendy. Especially the ending about it being NOTHING like Twilight. I honestly hated that comparison. To read any of the Wolves of Mercy Falls books and see anything Twilight related is absurd. I LOVED this book. And I agree that I'm more into Sam and Grace's relationship than the others. I just HEART Sam so badly. LE SIGH. Oh, thanks Lisa! I'm kind of tired of seeing every paranormal book compared to Twilight anyway, but especially when it comes to this particular book. I'm so glad you love it, too! I hope you will give it a try, Temptress! You might not enjoy it, but then again, you might love it too. People seem to fall in either one category or the other with this book. This one makes me incredibly sad and incredibly happy all at once. I totally agree with you Wendy. This book is far from other YA paranormal romances. It is definitely introspective. I love the fact that it is so lyrical. T'was a wonderful debut. I like that it's so different from all the other YA books out there. I think she actually wrote her fae book first, but this one is definitely my favorite. I'm glad you love it, too! Great review Wendy!! I really enjoyed this book too! still trying to find the right words...I hate the twilight comparisons this blows twilights doors off...why does twilight have to be the "proverbial measuring stick" there are so many way better books out there. The words will come, Heidi. :) Just let the book sit with you for a few days. I agree, I hate the comparisons to Twilight. It's overused in reviews, and it's particularly far-reaching in this particular book. Thanks Wendy I agonize over my reviews. I am almost done just polishing. I am going to disappoint you though. I am saving its posting for my blog which is finally almost ready to debut probably end of the week. I put your button on my blog roll. Thank you for all your encouragement along the way! Thank you I will keep you posted! I totally agree. It was beautifully tragic. I see no similarities to Twilight. "It's in a class all its own."